These precision-stamped screen cans, used to hold digital cameras in smart phones, require complex progressive dies and precision cuts made possible by employing a four-step sliding side-cut method. With its 108,000-sq.-ft. state-of-the-art stamping and molding facility in Taichung, Taiwan, Excel Cell Electronic (USA) Corp., East Hanover, NJ, focuses on precision stampings. Its Taiwan facility features a Yamada Dobby 80T NXT link-motion press and Yamada Dobby 80T crank-speed press and a quality-management system that includes measurement, ultrasonic-cleaning and electroplating machines. This commitment to quality enables Excel Cell Electronic (ECE) to stamp precision smart-phone components, specifically steel cans that enable digital cameras to be positioned into the backs of cell phones. 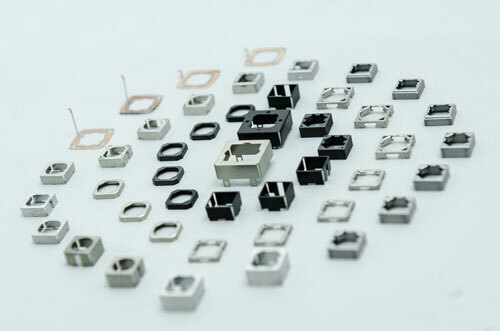 These micro components must be durable and increasingly smaller, says Julian Riedler, market developer for ECE. To accomplish this requires advanced equipment and processes, Riedler says. ECE’s automatic feeding system pushes the steel through a series of progressive dies that punch, coin and bend the material. Precision cutting on 0.15-mm 304 stainless steel utilizes a four-step sliding side-cut method on 1) punch-mold side-cutter slide moves downward; 2) side cutter is secured by the punch and die molds; 3) side-cutting slide moves downward, and the cutter cuts off part of the smartphone screen can; and 4) process is repeated four times to complete a four-sided cell phone screen can, resulting in a smoother, more precise cut. difficult to do with stainless-steel thickness of just 0.15 mm,” says Riedler. “We must punch down gently to accomplish this goal. Furthermore, we provided a clean cut for side-cutting edges. See also: Excel Cell Electronic (USA) Corp.